When it comes to the modern business office, it turns out it’s not your father’s cubicle farm anymore. Not long ago, it seemed a few edgy startups and co-working spaces were designing offices that looked very different—open concept with lofted ceilings and big, multipurpose spaces. They were the kind of spaces that seemed to breathe creativity—great for marketing companies and writers, but the rest of us? Well, some of us weren’t so sure. These days, even more traditional companies are getting in on the action, favoring flexible office spaces over traditional business spaces. Think shared office areas, spaces that accommodate multiple workers or small organizations, or maybe even spaces that utilize both the new and traditional: private offices and cubicles; open spaces and soundproof conference rooms; even adding in other possible work spaces, such as cafes, kitchens and quiet corners. All of these flexible office space options have one thing in common: common spaces. And it turns out there are several good reasons to consider a common space for your office, as such areas can translate into real benefits for your organization. Here are a few reasons why you may want to consider an open floor plan or common areas for your office. A study by Coldwell Banker Commercial Affiliates showed that staff may actually be happier in a more attractive physical space. The study looked at the preference of a number of age groups, ranging from those just entering the workforce to those retiring, and found that workers from all of the age groups valued both a social setting at work as well as convenience. Perhaps even more importantly, while staff spend more and more time at the office, they don’t necessarily want to spend all day, every day, behind their desk. Having access to a restaurant, sunny patio or lounge can make all the difference in helping them find comfort and convenience while meeting their practical productivity needs at work. 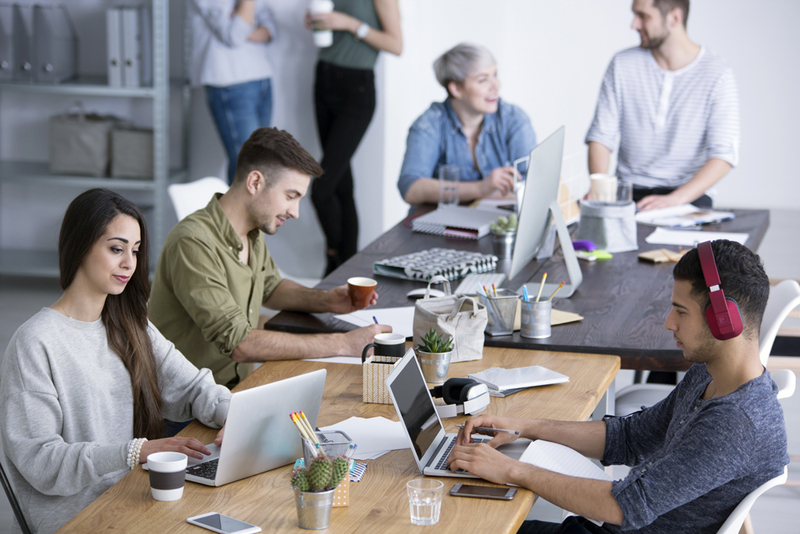 Collaboration can help speed solutions, and it turns out having common spaces in your office or an open floor plan can help staff at your organization collaborate more easily. Instead of conversations happening in the hallway, or via email, issues and questions can be swiftly addressed. It’s important to remember that not all work needs are met in the open-space environment, and there may be needs for quiet spaces for concentrated effort and special projects, or conversations about sensitive matters. By thoughtfully including options in your floor plan that include quiet spaces and soundproof rooms you can be sure that you are addressing a wider range of staff needs. Open office layouts and well-designed common spaces can create a stunning impression for your business, which can be great for entertaining clients and giving them the VIP treatment. But the benefits don’t stop there. Inspiration can be hard to come by in the world of cubicles; but beautiful spaces can be a source of inspiration for everyone at your organization. When you have to think outside of the box to reach your goals, why would your staff choose to sit within one? For your next office update, you may want to consider including common spaces or an open concept floorplan in your design. As you can see, there are several potential benefits to this trend, and in the end your organization could stand to benefit in several ways from a fresh look and an open concept design.